This appropriation funds the adoption subsidies program. The program is designed to help defray the cost of placing children with special needs, such as those with a handicap. The state should eliminate this program. Michigan’s civil society — which includes individuals, nonprofits, religious organizations, businesses and fraternal organizations — works to help people in need and will continue to do so. While the desire to assist families who have adopted a child from a state foster care program is admirable, this allocation merely spends $14.5 million pointing people in the direction of agencies that can help them. Private efforts, even Internet searches, can do the same. There are also many support groups that are organized loosely and prefer to remain discreet to avoid state attention. Michael LaFaive, Mackinac Center for Public Policy director of fiscal policy, reports that some foster parents’ support groups want to avoid state involvement because many of the complaints they wish to air in the support group are critical of the state foster-care system. In addition, information on the Internet is readily available to adoptive parents. Adoption Forums: 500+ message boards related to adoption. Adoption Cafe: Lively adoption discussion for all members of the Adoption Triad. Adoption Newsletters: Sign up for newsletters on adoption topics. Adoption Mail: Free e-mail @ Adoption.com. Check your e-mail from nearly any computer. Adoption Chat: Chat live right now with others touched by adoption. Adoption Calendar: Find out about local and national adoption conferences, workshops, and events. Adoption E-Cards: Create and send virtual cards, hugs, flowers, and chocolates to friends. Adoption E-Pals: Make friends with similar adoption interests. Share Your Story: Share your adoption story, or read the stories of others. Adoption Poetry: Let this special collection of adoption poetry move you. Adoption Experts: Ask a question of the adoption experts. Adoption Lists: Join E-mail discussion lists on adoption topics. Savings: $14,101,100. Governor Granholm’s 2005 proposal increases the gross appropriation to $14,166,600. The J.O.Y. Youth Center in Grand Rapids offers its services free of charge to urban youth ages 8-16. J.O.Y. offers after school recreation and crafts, homework/tutoring, and other wholesome activities. It reaches inner-city children with religious, educational, leadership, and physical training. Typically, approximately 250 children participate each week. The 25 volunteers employ a holistic approach to educating children and instilling self-worth. Children are placed in leadership roles to foster decision-making and responsibility. The J.O.Y. program is not the only private program in Michigan to offer such services. Another example is Urban Youth Ministries in Holland, which provides at-risk youth with educational and recreational opportunities. The organization uses field trips and athletic leagues to build relationships and minister to teenagers. Young people who show interest and potential are invited to participate in vocational courses that include woodworking, bicycle repair, upholstery, cooking, and photography. Savings: $12,757,200. Governor Granholm’s 2005 proposal decreases the gross appropriation to $12,482,700. This appropriation funds domestic violence prevention/treatment programs. Support services include transportation, information and referral, and advocacy in obtaining emergency health care, legal information, financial assistance, permanent housing, and childcare. While the state must play a law-enforcement role in protecting the most vulnerable of its citizens, there are many good religious and other non-profit organizations that have done excellent work in this area with trained staff, volunteers and donors who are committed to the work. For example, the Ramoth House in Grand Rapids offers battered women and their children a safe-house, crisis intervention, information and referrals, legal advocacy, housing and job assistance, transportation, child care, individual counseling and support groups. In Midland, the Shelter House does the same. Institutions such as this exist all over the state and could more easily expand, if government at all levels didn’t take 40 percent of peoples’ incomes to fund programs that are not superior to private-sector ones. Savings: $13,476,300. Governor Granholm’s 2005 proposal increases the gross appropriation to $13,695,600. This appropriation funds teenage parent counseling. This program provides supportive services, group home living, and prevention counseling for teenage parents. Families, religious organizations, and non-profits can and do meet the needs of young mothers. For example, the Family Life Center in Allendale serves young women dealing with unplanned pregnancies. The Center offers a close family atmosphere by housing all of the women in one home, supervised by a live-in house parent. The young women are required to pay 30 percent of their income in rent, while another 10 percent is put into savings. They are provided a structured and caring environment to help them get on their feet. This is not the only city in Michigan to benefit from private charitable services for young mothers and mothers-to-be. Savings: $3,771,300. Governor Granholm’s 2005 proposal increases the gross appropriation to $3,793,500. This appropriation funds the Black Child and Family Institute. This program provides health screening, physical exams, education, and tutoring for African-American families in the city of Lansing. These private human welfare service providers could do a great deal more if government did not: a) crowd them out with programs of its own; b) take from citizens the very money (in taxes) they might otherwise contribute to these organizations; and c) engage in charity that requires nothing of the recipient. Michigan’s government should step aside and allow charitable organizations to do the work they are most qualified to do. This would not only be of the greatest help to the poor; it also would revitalize community life by giving those more fortunate the opportunity to take personally the task of caring for their less fortunate neighbors. Savings: $100,000. 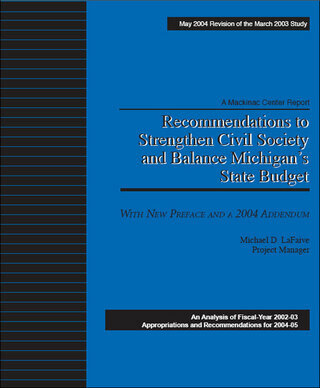 Governor Granholm’s 2005 proposal leaves this appropriation unchanged over the previous year’s budget.